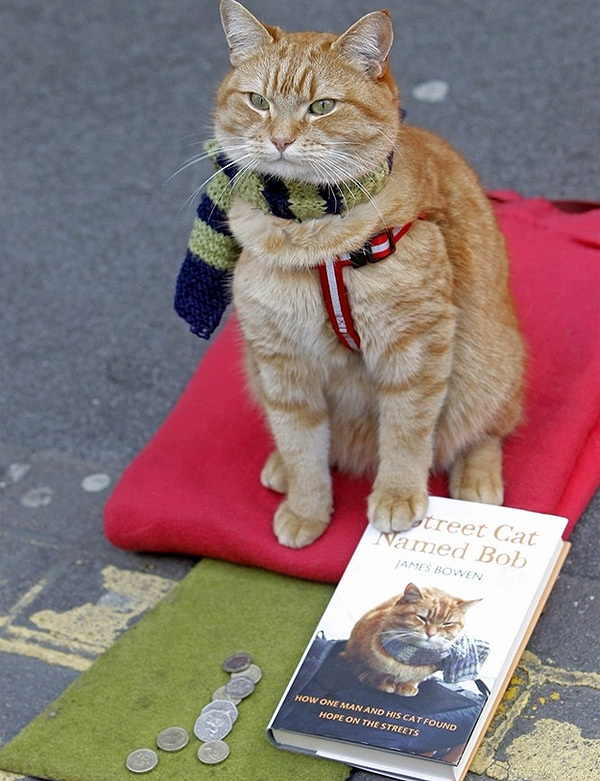 Whether you're a cat lover or not, it's hard not to be moved by this true and uplifting tale with a very happy ending. It's about the extraordinary friendship between James & Bob. One is a musician who busks on London's streets, having recovered from years of homelessness and heroine addiction. 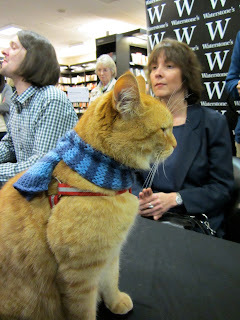 The other is a beautiful, striking and intelligent ginger tom cat who was a stray with an injured leg. They are kindred spirits who were destined to rescue each other during their darkest times and help nurse one another back to health and happiness. 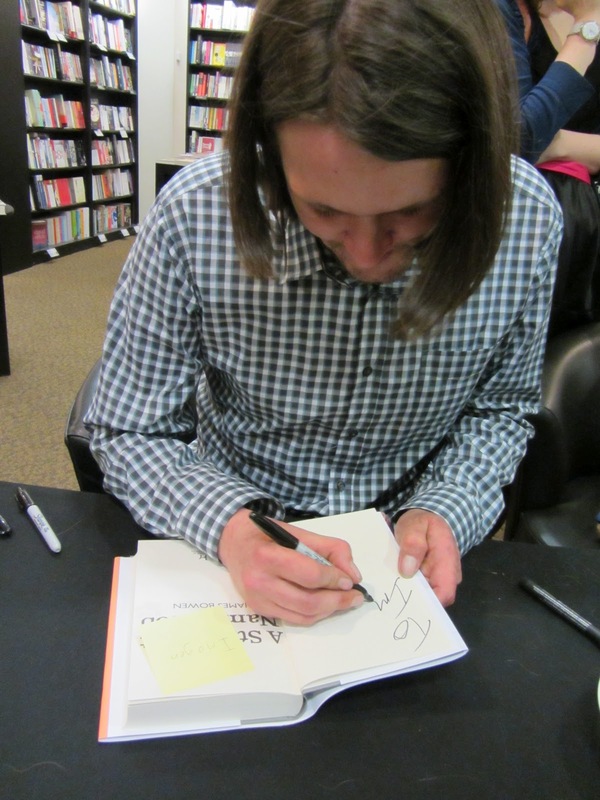 In spring 2007, James Bowen was returning to his sheltered accommodation in Tottenham after a day of busking around Covent garden. He spotted the ginger tom curled up in the corridor, and being a cat lover, he couldn't resist saying hello. A few days later the cat was still there and clearly a stray, so James took him in, fed him, and took him to the RSPCA to get antibiotics for his wounded leg. Once he was on the road to recovery, James tried to find a home for him, but the cat wasn't having any of it and made it quite clear that he wanted to live with James. Little did James realise what a life-changing moment this would be. He named the cat Bob (after Killer Bob from Twin Peaks due to his slightly schizo character), and the two have been inseparable ever since. London is a lovely place to live when you've got an income, a warm bed to climb into at night and food on the table. But if your home is on the streets, then it must be a very lonely, scary and hostile environment to live in. And James should know. He spent several years living an invisible existence as his life continued on its downward spiral into heroine addiction. But he found the determination to get his life back on track, one step at a time, and took part in a drugs recovery programme and has now been clean for a few years, which is really excellent. And finding a companion in Bob not only gave James a new sense of purpose and responsibility, but a great friend to share adventures with. With his unconditional support and love (and his only ask being a few biscuits and the odd chin rub) Bob has given James the strength to stay off drugs and look forward to the future. Wherever James goes, Bob goes too. 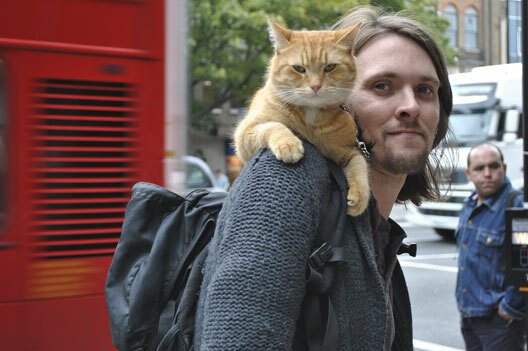 Whether it's on the bus or the tube, Bob will follow wearing his harness, or if he gets tired, he just sits on James' shoulders. Transport for London have even given him his very own photo travelcard! They are quite clearly a team, and whilst James plays his guitar or sells the Big Issue, Bob just hangs out on his rucksack, relishing all the attention from passers-by. James has even taught him how to 'high five'! Bob wears a signature scarf and has so many admirers knitting them for him now that he's acquiring quite a collection. And he's a great babe-magnet for James too. I'm sure he's got the ladies queuing around the block! 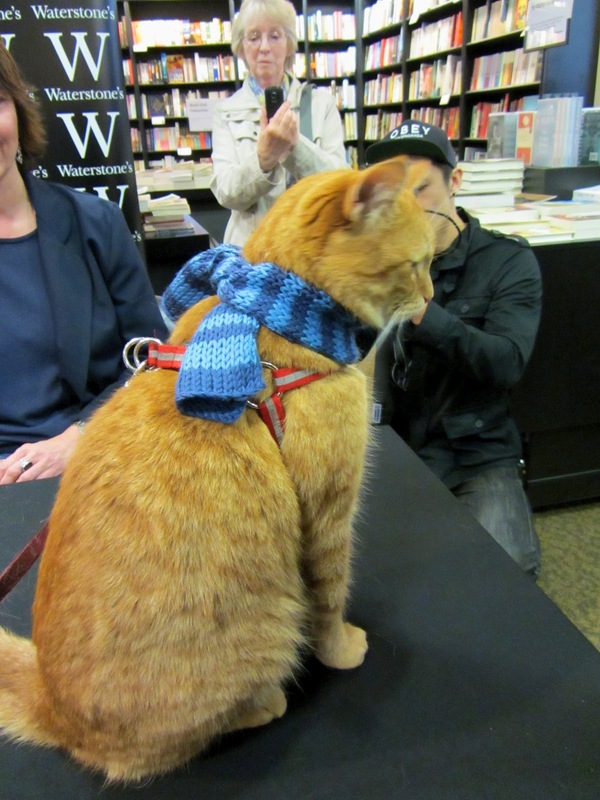 Well that was certainly the case when I went to Waterstone's last week, where James and Bob were doing a book signing for their wonderful new book, A Street Cat Named Bob. A literary agent used to pass James & Bob daily on her way to work and one day stopped for a chat. The long and short of it is they now have a book deal about their story. 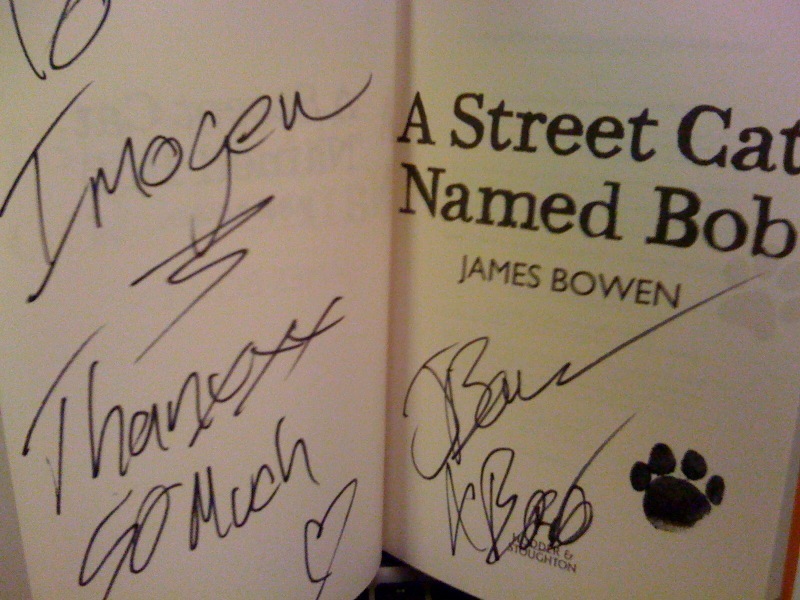 I joined the queue and felt very privileged to meet this fabulous duo and get a signed copy (complete with Bob's paw print) of their special story. It's an inspiring read, so I suggest you get yourself a copy too. High five! I'll add a link to my sidebar to yours. Nice post. I love the photos. I too loved the book and it is nice to see them here..
Just finished reading the book. It's so beautiful. so heartwarming. I'm both laughing and crying.